Please note: striped screen is for demonstration purposes only. All of our screen material is black. Our hidden screen door is situated underneath the top of your door frame, so your doorway is completely unobstructed when the screen door is up. 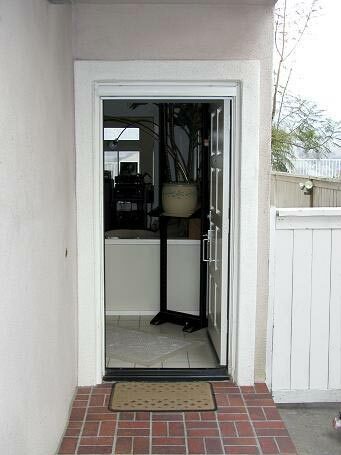 This is an obvious advantage over old swinging screen doors which are always in the way. 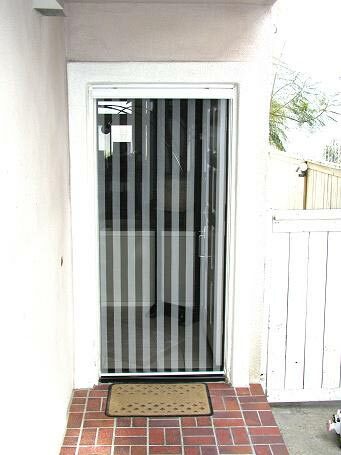 Even expensive sideways retracting screen doors have an unsightly and space consuming housing along the entire side of your door frame. The pull-down screen door keeps the bugs out. When you want to open the roll-up screen door, easily disengage it with your foot, and the screen rolls up smoothly and safely. Secret Screen pull-down screen doors have many names: retractable screen door, invisible screen door, hidden screen door, roll up screen door.